Lawsuits challenging the constitutionality of public education funding systems are currently underway in 21 states.1 Litigation represents an opportunity to restructure the ways in which public education is financed, expanded, and delivered to children across the country. Public engagement plays a uniquely important role to ensure real improvement in our schools. 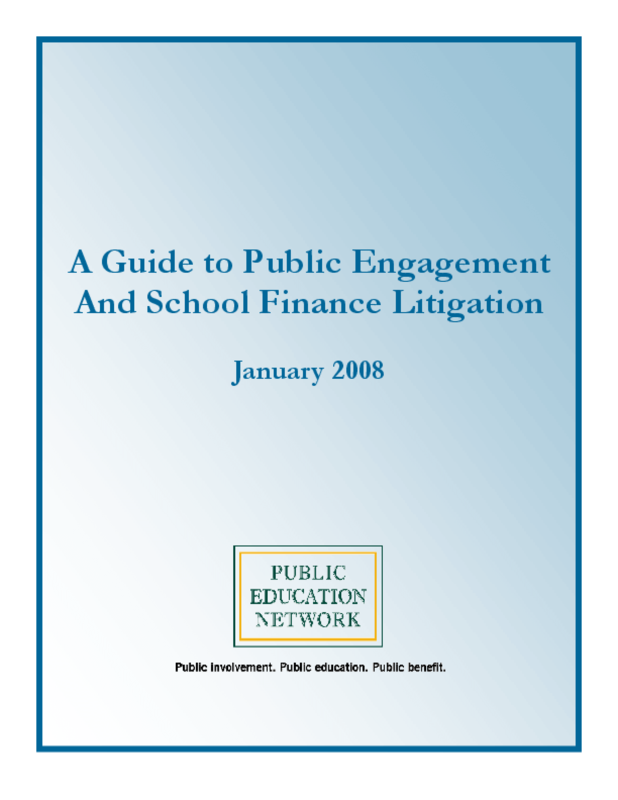 Public Education Network ("PEN") has developed this Guide to encourage community-based organizations to employ public engagement strategies while school finance litigation takes place in their states. While litigation may at times seem daunting and complex to non-lawyers, community-based organizations can do much to become involved in the process. Organizations can utilize public engagement strategies to ensure that the outcome of the litigation reflects the interests of constituent groups and the public. This Guide is organized to make the process of school finance litigation meaningful and accessible to a large audience. What does school finance litigation mean? How does it come about? Whom does it affect? What options and outcomes does it make available to communities? These are among the many questions and practical considerations addressed in this Guide. An introductory section explains why public engagement and community involvement are critical in the fight for public school resources, and how community-based organizations can play active and direct roles in helping to secure resources for public schools. The second section explains how education finance policy is made in theory and practice. Historically, what has been the role of the legislature, the court, and the school district in the policymaking process? The third section explores where local education funds ("LEF") and other communitybased organizations fit into this process. We articulate a four-phase approach for community-based organizations to impact school finance litigation. Each phase is illustrated by an example of a support role played by an LEF or other community-based organization. Litigation is usually subject to lengthy delays, often lasting years, even after a court finds an existing education system unconstitutional. The reasons are often political. Elected officials feel little urgency to reach a solution that may be unpopular with the public. In the delay we lose sight of the real issues -- children, teachers, and classrooms. And children continue to go to school under a system that has been found to be unconstitutional. Our hope and belief is that, with a sharpened focus on children, teachers, and classrooms, brought to bear by public engagement efforts, public pressure will move lawsuits along expeditiously to ensure that all children receive a quality public education.